Face it, Adobe Photoshop is exceptionally complicated. Even if you know the basics and aren't a beginner, there is just way too much functionality in that program. 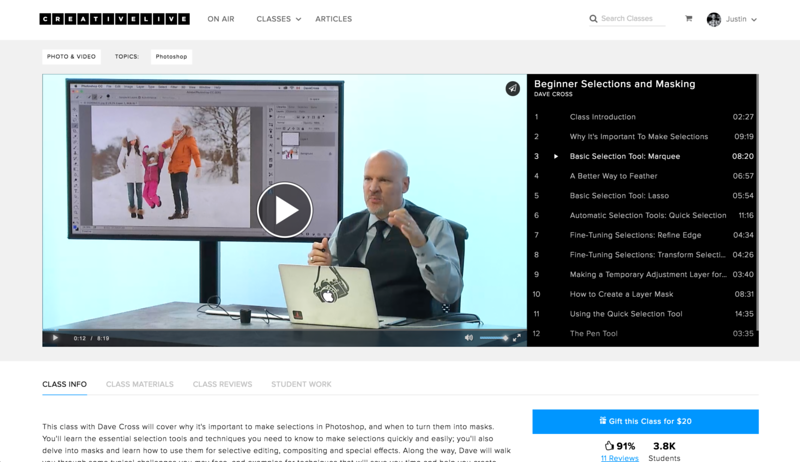 But the good news is that the internet is here to save us, in the form of some pretty cool online Photoshop classes, speciically geared for photographers. 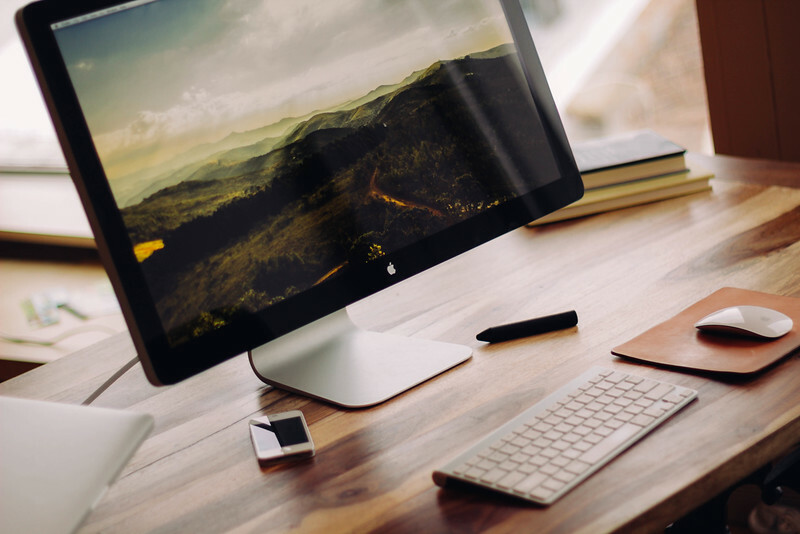 For many of you, the goal may be to learn Photoshop once and for all. You have probably been putting it off for a few years, or maybe have been flirting with Photoshop by using just one or two features. But you're ready to learn it all. The good news? There is a seriously amazing and comprehensive online photoshop coures to help you with that. However there are also a lot of you who are more like myself: who have a desire to only learn the specific tricks of Adobe Photoshop that can fix, enhance, or improve your photos. You're not trying to learn everything about how to use Photoshop, just the things that matter to your photography and your craft. I have compiled a bunch of seriously awesome photoshop classes that will help you achieve that goal. This is it, the one all encompassing online Photoshop class that will teach you how to use this software, from start to finish. Photoshop: The Complete Guide is the course that you purchase if you want to have the answer to every single Photoshop question you will ever have, at your disposal forever. 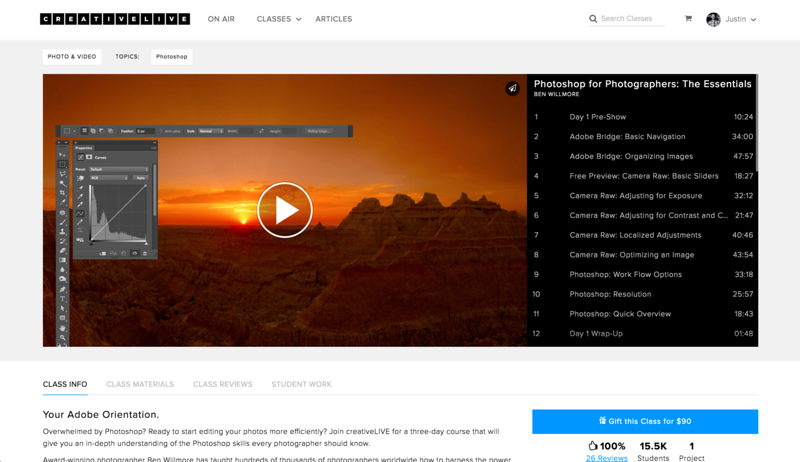 If you are truly new to the world of Photoshop, this is the best place to start. Even if you aren't starting from scratch, this full course has every piece of information for Photoshop that you could ever need. Just take a look at the reviews to see what I mean. 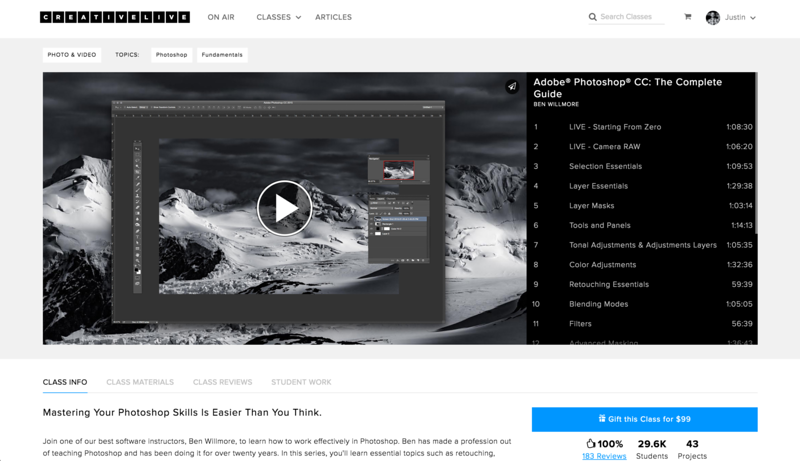 I have talked about this particular online Photoshop course a lot. It's easily one of my favorites for a number of reasons. First, Matt is just a great instructor. He relays technical and complex information in an incredibly reliable and comprehensible way. 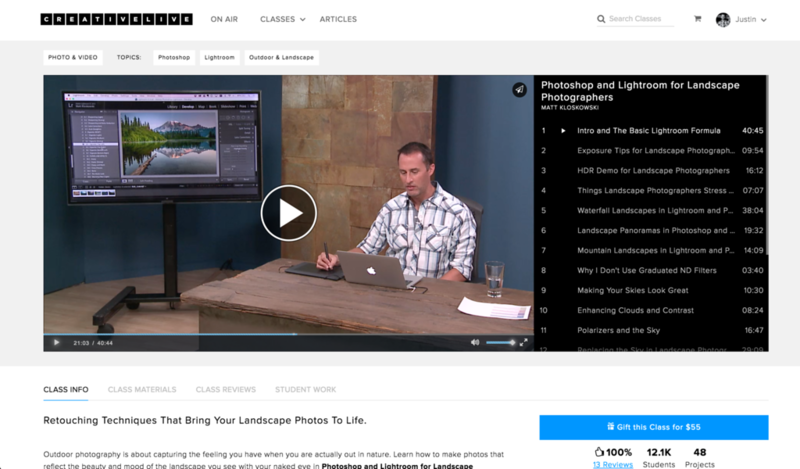 I like this class a lot because it really just focuses on the most useful techniques for precisely my kind of photography (landscapes and outdoor) in both Lightroom and Photoshop. Well worth the money if this is your kind of photography. The semi-recent upgrades of Adobe Creative Cloud for Photographers are so powerful because they deliver the possibility of truly integrating your workflow between both Lightroom and Photoshop. There are things that you can only do in Lightroom, and things that you can only do in Photoshop. But the real magic begins when you understand how to switch back and forth with a single image for maximum effectiveness. 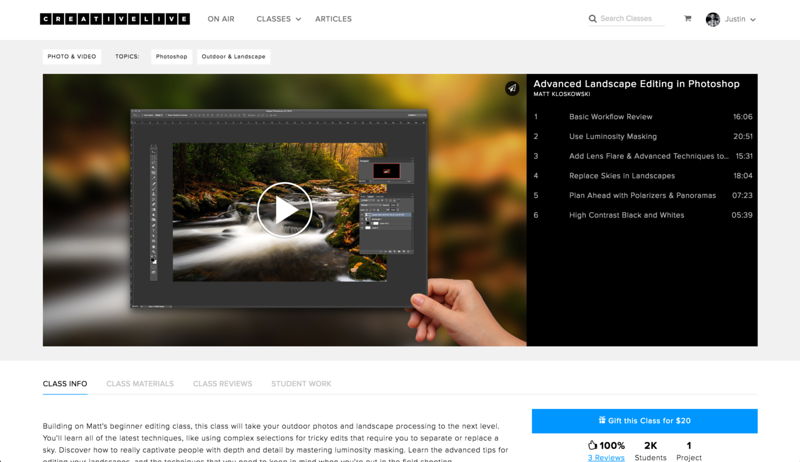 This online Photoshop class shows you how. I'm not a portrait photographer, but I'm friends with a lot of them. In our opinion, portait photography is the area where Adobe Photoshop truly shines. Lindsay Adler is an incredible presence as an instructor. She has such a command of the information in a way that I have never seen. She has built her portrait photography business into such a success because of her knowledge, and she does such a great job at communicating all of that knowledge to us in her course. As an expert Photoshop instructor at CreativeLive, Ben Willmore knows every feature of the program. Almost more importantly, he knows what features are necessary for specific use cases, and which are not. This Photoshop for photographers course is a great overview of every feature that photographers might benefit from. This three-day course will give you an in-depth understanding of the Photoshop skills every photographer should know. 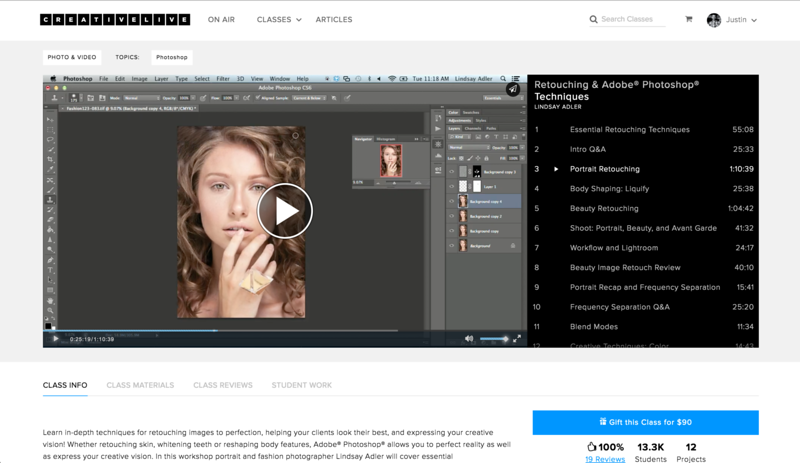 You’ll learn about optimizing images, sharpening, retouching, black and white conversion, directing the viewer's eye, and much more. Take the guesswork out of Photoshop by learning which menus and tools are essential -- and which you’re better off ignoring. UPDATE: I have gotten word that this course is on an outdated version of Photoshop. However I have also heard that a replacement is coming soon. Selections and layer masks are a critical part of Photoshop. This beginner-oriented class with Dave Cross will cover why it's important to make selections in Photoshop, and when to turn them into masks. You'll learn the essential selection tools and techniques you need to know to make selections quickly and easily; you'll also learn how to use masks for selective editing, compositing and special effects. During the course, Dave will walk you through some typical challenges that you may face, and then will give examples for techniques that will help you overcome those challenges, help save you time, and help you create realistic masks to enhance your photos. This more advanced Photoshop for photographers class will enable you take your outdoor and landscape photos to the next level. Matt is really great at helping you understand the latest techniques, like using complex selections for tricky edits that require you to separate or replace a sky for example. Lightroom is amazing for landscape photography, but mastering luminosity masking and some of the other advanced tips for editing your landscape shots in Photoshop will enable you to do some pretty awesome things that Lightroom and other photo editing programs simply can't. 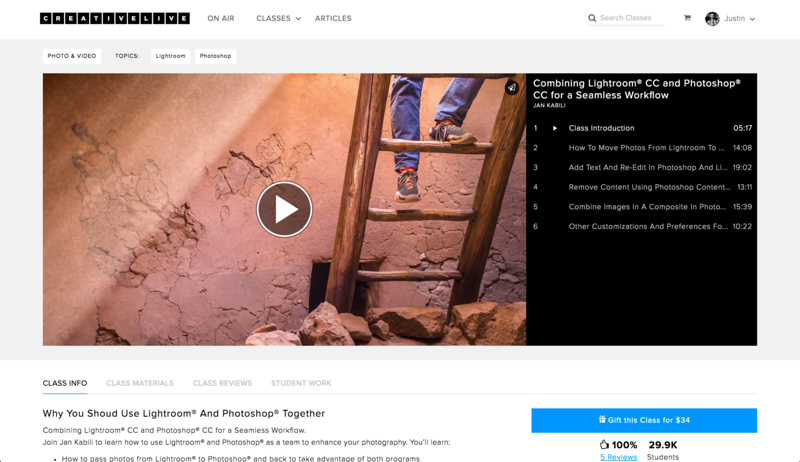 In addition to Photoshop, As a photographer you are also going to need to learn Lightroom with online classes. Both of these photo editing software from Adobe are extremely powerful programs, and you will need to figure out when to use Lightroom vs. Photoshop, and how to integrate your workflow to get the most out of both. All of the above online photoshop classes are awesome, and you will definitely be finding yourself referencing the material for years to come. Just check out the reviews for any of them and see what I mean. Deciding which ones to buy for yourself is going to largely depend on your personal preference of instructor and their teaching style, as well as the specific skills you are hoping to learn.